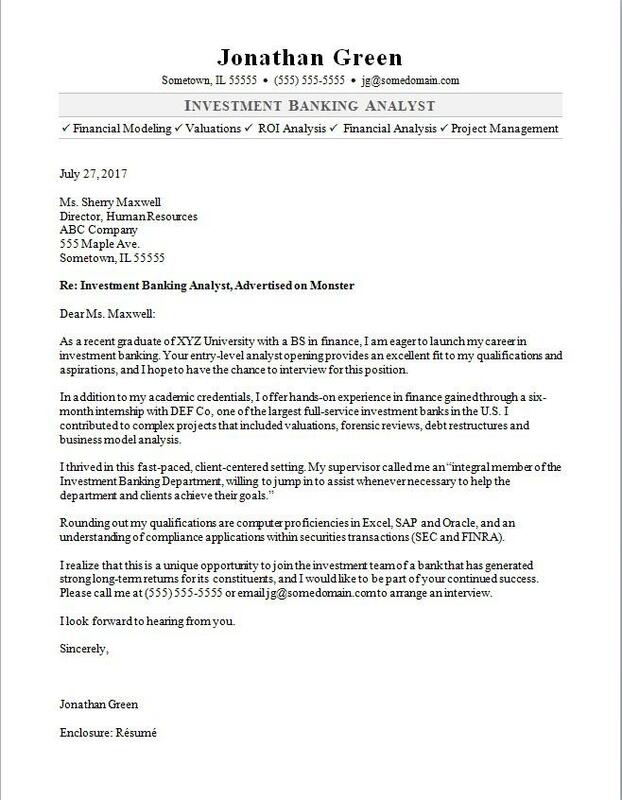 View this sample cover letter for an investment banker, or download the investment banker cover letter template in Word. As an investment banker, you’re hired to get results. Your cover letter should demonstrate your skills and experience, as well as your passion for your work. To be considered for top investment banking jobs, it helps to have a well-crafted cover letter. For writing tips, view this sample cover letter for an investment banker, or download the investment banker cover letter template in Word. Jobs in this field are projected to grow by 6% (or 23,300 jobs) from 2016 through 2026, according to the Bureau of Labor Statistics (BLS). You'll find the highest level of employment for securities, commodities, and financial services sales agents in the following states: New York, California, Texas, Florida, and Illinois; and in the following metropolitan areas: New York City, Chicago, Los Angeles, Dallas, and Houston. As an investment banker, you can expect to earn a median wage of $63,780 per year, or $30.66 per hour, according to the BLS. Additionally, you can search for investment banking jobs on Monster. As a recent graduate of XYZ University with a BS in finance, I am eager to launch my career in investment banking. Your entry-level analyst opening provides an excellent fit to my qualifications and aspirations, and I hope to have the chance to interview for this position. In addition to my academic credentials, I offer hands-on experience in finance gained through a six-month internship with DEF Co, one of the largest full-service investment banks in the U.S. I contributed to complex projects that included valuations, forensic reviews, debt restructures and business model analysis. Rounding out my qualifications are computer proficiencies in Excel, SAP and Oracle, and an understanding of compliance applications within securities transactions (SEC and FINRA). I realize that this is a unique opportunity to join the investment team of a bank that has generated strong long-term returns for its constituents, and I would like to be part of your continued success. Please call me at (555) 555-5555 or email jg@somedomain.com to arrange an interview.